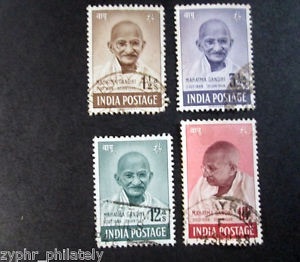 Indian Postal Authorities issued on 15th August, 1948, 4 Stamps of Mahatma Gandhi to commemorate the first anniversary of Independence and in mourning of his death. They are with denominations and colours : Brown – 1.5 Anna; Violet -3.5 Anna ; Dark grey green 12 Annas, and Purple brown Rs. 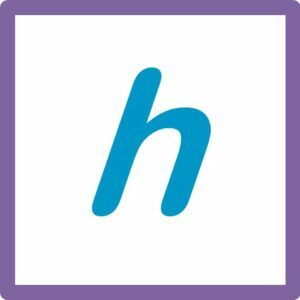 10/-. The first three stamps are, to some extent, are freely available at a cheaper price ( up to Rs 500 per stamp). The fourth one with a denomination of Rs10 is scarce and the price quoted by various dealers ranges from Rs 20000 to Rs 100000 per stamp, depending on whether it is in unused (Mint) or used condition. I understand that the high price is due to the limited quantities printed. In the above context, I would like to highlight a news paper item. As per Times of India dated 20th April, 2017, a set of 1948 stamps picturing Mahatma Gandhi was sold for record 500000 pounds (approximately Rs. 4 crores). ” The Unique strip of four ten rupee stamps is considered the most important and desirable item of post Indian Independence philately” , said the U.K. Based dealer Stanley Gibbons. These stamps are emblazoned with the word ” Service ” and were issued to the then Governor General’s secretariat for official use. 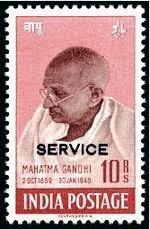 Recently I was surprised to see the price of this Rs 10 stamp drop to Rs 2000 per stamp. Then I saw, in small letters, it was written “reprinted and not original”. I am not sure about the authenticity- whether it was reprinted by the postal authorities or a forged one. This stamp, which is scarce in the market, is the most wanted stamp by the private collectors. Hence, if you have this stamp, please treasure it.